This isn't the first time a miner has gratuitously invoked the nation of South Africa. Unfortunately, meet-ups like this never occur, because the South African carebears never threaten South African Agents. Bad luck, I suppose. Finally, Reaver reassures us that he hasn't been pissed off "yet". Sometimes I find it difficult to trust carebears. 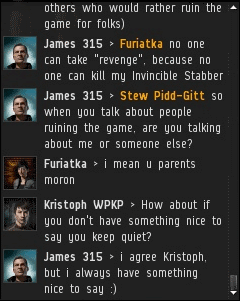 They lie about having powerful friends in nullsec, so how can we believe them when they say they're calm? 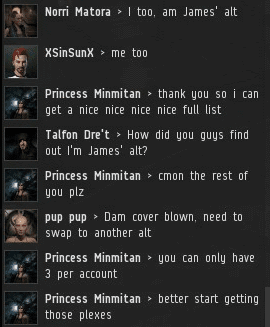 Meanwhile, Santa's Secret made the rounds in highsec, urging players to participate in some gift exchanges. 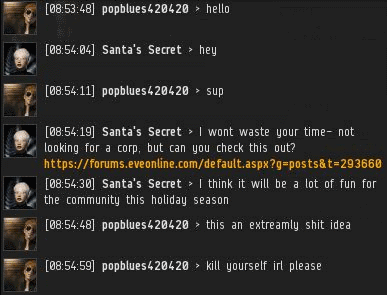 popblues420420 is already getting into the Christmas spirit. 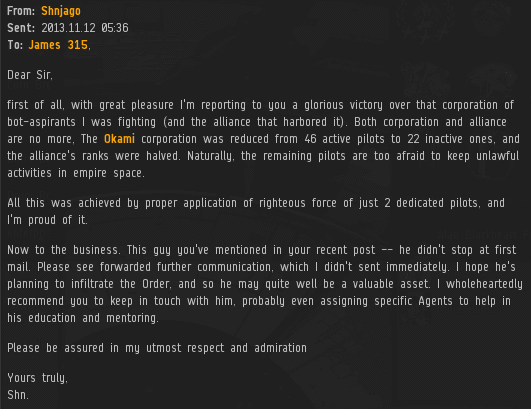 At first, I assumed my bounty notification meant that another misguided rebel put some more isk on my head. Actually, he put 20 million on my corporation, Experimental Fun Times Corp RELOADED. When the corp inevitably folds and re-opens, that's another 20 million down the drain, I'm afraid. It's very suspenseful whenever I receive an EVEmail from a participant in Erotica 1's bonus room. Will the player win big? Or will they break the rules? ...Another disappointment. I wonder why Mary Tzestu had such difficulty reading the Code? According to the MinerBumping site statistics, the Code page has been accessed over 71,000 times. There's no telling what percentage of the readers really absorbed it, though. It's often said that holiday season is the most stressful time of the year. 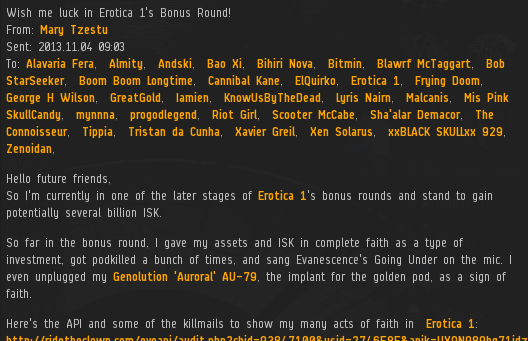 Maybe that explains why so many highsec residents are pondering the real-life deaths of EVE players lately. 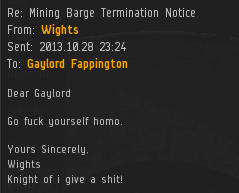 As we've seen, Agent Gaylord Fappington has earned the admiration of EVE players far and wide. Despite their extraordinary level of power and fame, New Order Agents always remember where they've come from. For example, the time they spent dealing with miners like Wights. 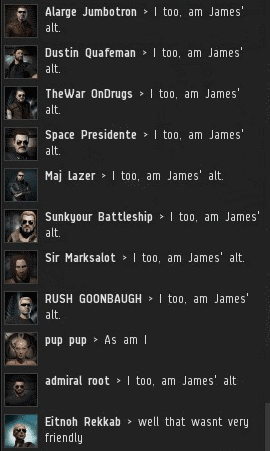 Helping the worst miners of highsec realize their full potential--it keeps us rooted in the community. From the beginning, the New Order has inspired denialists of every stripe to see a James 315 alt behind every face they see. For most people, these accusations are good for a few chuckles, or perhaps a "Spartacus" reference. ...But for others, the delusion of the Infinite Alt Theory is all too real. By this point, I would need SOMER Blink's wallet to fund the PLEX of all the alts I'm supposed to have. If by "last summer" Pabst Thellere was referring to the summer of 2012, then of course he knows what I did. Everyone knows. That's when I wrote the Code and founded the New Order. Every child who takes a civics course should know that! Where is Erotica 1's bonus room grab bag? Oh yeah, bit of a sore point I'm sure. The tide starts to turn. No more CSM for the code. the code does not need a csm representation as long as the code is in the players heart. "Where is Erotica 1's bonus room grab bag?" What do you mean? It's right there in the post. If your mind is too feeble to endure reading the whole post, search for "Mary Tzestu" in the text above and you will find a screenshot from a satisfied bonus room participant. @anon 9:34 - "satisfied bonus room participant" - satisfied for whom? Would you smear yourself with mayonaise and have a photograph of that posted to the internet? Satisfaction has nothing to do with the participant and everything to do with the people running the 'show'. It's about RL ridicule and potentially RL embarassment at some point in the future. Lines definitely crossed in the bonus room where a scam was taken beyond the game and a very creepy collection of photographs taken. And all intimate to the code. and it's 'emergent gameplay'. You are all tied to it and that's what the code. will be known for now and associated with. Funny how the detractors make it out seem like Erotica 1 some how sneaked into peoples houses and forced them at gunpoint to make fools of themselves and then took pictures of it. Really greedy people willingly joined the bonus room, willingly signed on to teamspeak, willingly started giving all of their assets to strangers, willingly sang songs, and willingly took pictures of themselves and then willingly uploaded them for all to see. They did this all themselves with the hope of a big pay off. They willingly, publicly, prostrated themselves IRL at the hope of getting a lot of space bucks. I love how Erotica gets people to come on mic and sing. This entire article is a logical fallacy, heh. You think it's a logical fallacy, but you're not sure which one, heh? Come back when you've at least learned their names, so I can explain to you why you're wrong, heh. I'm going to agree with Solstice Project here. Even though the actions are voluntary on the contestant's part, I could understandably see why they'd be very annoyed when they eventually lose especially since there is a lasting IRL effect. Tellingly, you fail to mention the actual IRL effect. This is because there isn't one. The pictures are grossly exaggerated. Most are simply people holding a sign, generally with faces covered, as was suggested by Ero for privacy. There was a "peanut butter" pic where a contestant wrote Erotica 1's name on his chest in peanut butter, mostly the contestant's idea, with no face shown. There are two suggestive pictures by one of Ero's friend's girlfriends. Ero did not ask for these pictures, as the audio recording proves, and Ero made it clear that if these would be linked, they would be widely posted and shared. The girl in the picture repeatedly said it was her idea and she wanted to do it and have the pictures out there "for nerds to fap with."